The last time I did one of these, it was with my school bag/purse that was jammed full of school supplies. This time, it's my actual purse. And at the time of writing this, I have only a general idea of what the hell is currently residing in there. 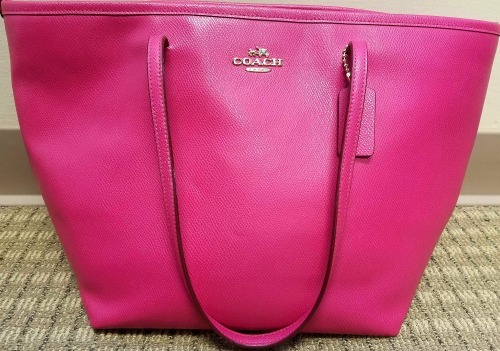 First things first, my purse is a hot pink coach tote bag with only one main compartment, two smaller slots for phones/pens/small stuff, and one zip pocket in the back. Biggest thing/Best thing - my Erin Condren planner. I carry it to work with me almost everyday. It really just helps to keep me on schedule for the day. Remember that little notebook I told you about in my faves? Yep, it's in here. Along with some papers while I teach myself hiragana. 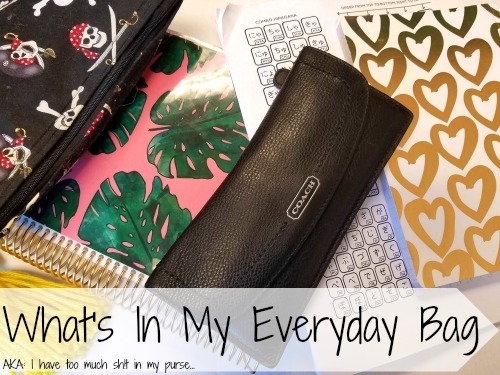 My everyday makeup bag is in here too! The bag itself was a birthday present from my friend who's sister makes those awesome bags from Regal Beagle stitchery. It's large enough to carry all my makeup wants and needs. Ooh and my wallet! It's a slim coach wallet and I loooooove it. My hairclip, watch, and tangle teezer. As well as 2 hair ties, an eos lip balm, my armband from the hospital, and a single falsie (it's the Ardell natural style if you wanna know). Ooh some receipts, very fancy and organized. Einsteins and Panera ain't got nothin on me. Hand sanitizer and my meds from when I was sick that should be in my medicine cabinet at home (that aren't shown because they have my full name and address). Spare change. 3 pens and a sharpie. This octopus hanging thing that's supposed to hang from my rearview mirror but somehow managed to end up in my purse. And THAT is everything from the main compartment - the side compartment is next. Which is where I keep all my giftcards - I have a tendency to lose them if I leave them hanging around my house. 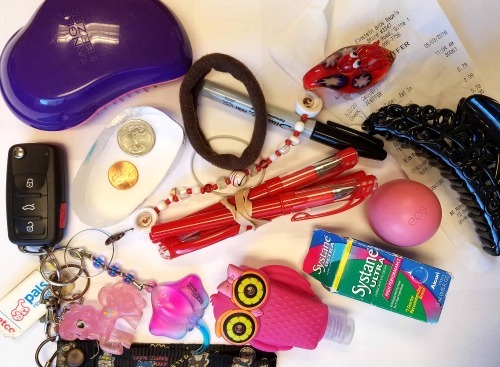 Sooooo, they've all managed to migrate and organize themselves in my purse. Annnd apparently I've confiscated a ton of wet naps from a restaurant - idk which restaurant though. I've also got 5 more hair ties in there, a bracelet, some spin pins (which I swear by), and another small clear hairclip. 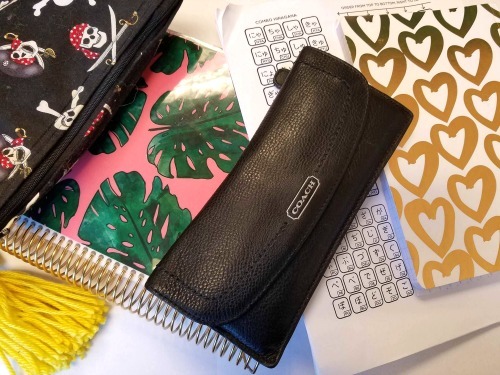 Doing this post has made me realize that my purse is an absolute mess and that I really need to clean it when I get home. But let's be honest... it's just gonna end up like this again. Haha hey - they're free! And sometimes my hand sanitizer is a bit overwhelmingly smelly for some. 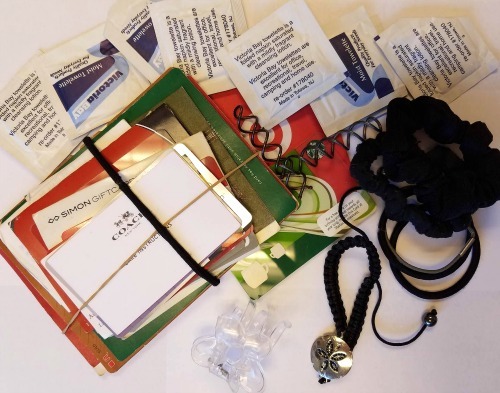 I love knowing what inside people's bags. I don't know why, maybe I'm just that nosy. Lovely post, btw.